Meet Henk, the god of technology He (or rather it, as gods are sexless) is the one that brings ideas and innovation to those that worship it. This is the story of his creation. It is a fearsome thing, with scissors as hands, motor parts for shoulders and a circular saw for a hat. He wields a machete and generally looks like somebody you don't want to get into a fight with. Intrigued, I looked at the sign. 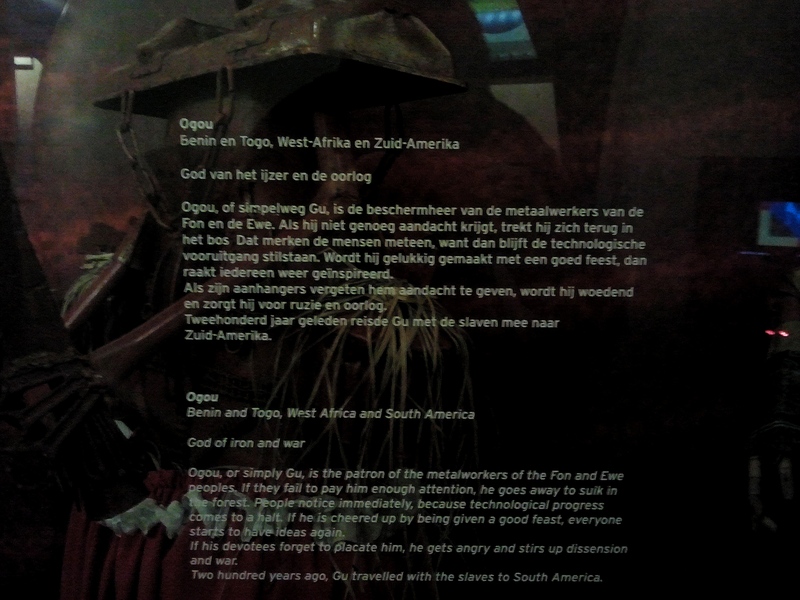 The sign reads  :Ogou, (Benin and Togo, West Africa and South America) God of iron and war Ogou, or simply Gu, is the patron of the metalworkers of the Fon and Ewe peoples. If they fail to pay him enough attention, he goes away and sulks in the forest. People notice immediately, because technological progress comes to a halt. If he is cheered up by being given a good feast, everyone start to have ideas again. If his devotees forget to placate him, he gets angry and stirs up dissension and war. As an former engineering student, a scientist and as a hacker, I could instantly relate to the notion presented above. Especially the part where regularly partying with rum and cigars pleases the god of technology, who will reward you for it with new ideas. What's not to like? I got inspired both by its appearance as well as the story behind it, and I just had to have my own Gu. However, one does not create techno-deities alone, one needs a hackerspace full of technology worshiping nerds to accomplish such a feat. So, after laboriously scrounging, collecting, cutting, welding, soldering, installing and rebooting a pile of metal and computer waste, we have him. Our god of technology. This process of extreme case modding has lead to the sculpture referred to by Revspacers as the "robot". The "robot" is a fully functional linux PC. Many people contributed physical labor and ideas to the sculpture. Thanks! You too are welcome to physically/software hack it. It still has to be sanctified somehow. I wonder how to do that? Perhaps something with rum and cigars... ? ↑ He is not really a god, but rather an orisha and loa. Orisha is a spirit or deity that reflects one of the manifestations of Olodumare (God) in the Yoruba. Orisha is an "intermediary between man and the supernatural. 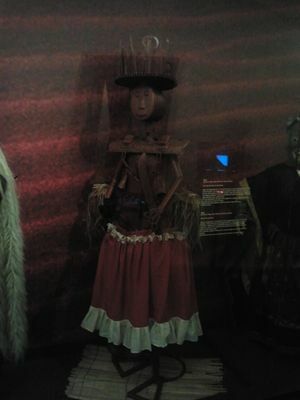 The Loa, likewise are see to bee the spirits of Haitian Vodou. They are also referred to as Mystères and the Invisibles, in which are intermediaries between Bondye (Bon Dieu, or good god)—the Creator, who is distant from the world—and humanity. Unlike saints or angels however, they are not simply prayed to, they are served. They are each distinct beings with their own personal likes and dislikes, distinct sacred rhythms, songs, dances, ritual symbols, and special modes of service. Contrary to popular belief, the loa are not deities in and of themselves; they are intermediaries for a distant Bondye. The term is often translated as "deities" or "divinities"
This page was last modified on 27 October 2016, at 22:07.